Discover inner city living at its best in this brand new 1BR luxury apartment. 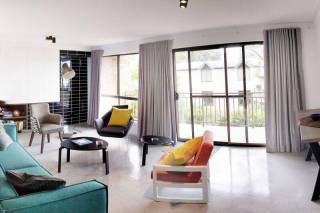 The apartment is decked out with funky living and dining room furniture, a brand new HD flat screen TV with platinum Foxtel access and a fully equipped kitchen, including a Nespresso coffee machine with an initial supply of capsules provided. 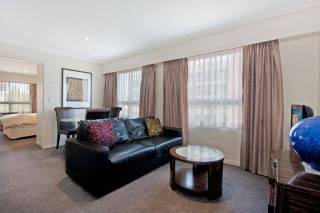 As with all Uptown Apartments, linen and towels are provided and wi-fi access is free of charge. The apartment features a good sized bedroom with queen bed and ensuite bathroom, separated from the open plan living/dining and kitchen area by sliding glass walls. 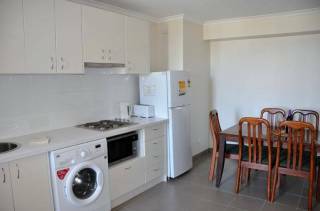 There is ample storage, with a European laundry located in the entrance corridor. 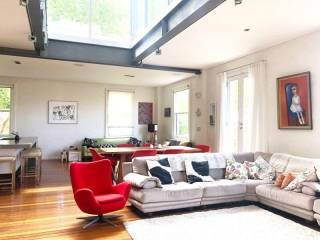 The location could not be more perfect - just five minutes from Sydney's CBD, Kings Cross and Potts Point, and two minutes from Oxford St. Bus stops that service Paddington, Bondi Junction, Bondi Beach and beyond are right on your doorstep. Darlinghurst is a cosmopolitan suburb, with busy cafes, restaurants, bars and nightlife venues along Oxford, Crown, Victoria and Stanley Streets. The Darlinghurst Village is a heritage precinct where the majority of buildings are early 20th century terrace houses. It comprises 20 blocks bounded by Barcom Avenue, Forges and Oxford Streets and Taylor Square. Oxford Street is Sydney’s most famous shopping street, where you will find everything from supermarkets and gift shops, to alternative clothing boutiques, late night bookshops and music stores. Darlinghurst is home to a range of exceptional designer and home wares outlets, as well as a great selection of various ethnic cafes and restaurants, from basic to up market. Oxford Street' exclusive cinemas, the Chauvel and the Palace Academy Twins and Palace Verona, specialise in foreign and art house films and International Film Festivals. Everything Sydney has to offer is at your doorstep! Though parking is not included with this apartment, it may be available upon request, subject to availability. Please note there are no extra beds available in this apartment for extra guests. Following these rules will ensure your security bond is returned to you in full and on time. Breaking these rules may result in charges being incurred as detailed in our terms and conditions. If you respect the apartment as you would your own home, you can relax and enjoy your stay. These Terms and Conditions constitute the Rental Policy and regulate the provision of short term accommodation between Uptown Apartments Pty Ltd and its guests. (i) To book a property directly with Uptown Apartments, we require that you pay an initial deposit of 50% of the full booking tariff (including the security bond - see clause (a)(iv)), followed by the balance payment to be paid at least 14 days prior to your specified arrival date. If you have not already organised payment with us, your balance payment will be processed automatically 14 days prior to your arrival. (ii) If your booking is for a period longer than 42 days, your booking will be split into two or more instalment payments, with 50% of the first instalment due as deposit and the balance of the first instalment due at least 14 days prior to your specified arrival date. You authorise us to automatically process each subsequent instalment as and when it is due. (iii) If you make a booking within 14 days from your specified arrival date, you must pay the full amount (or full first instalment payment for bookings over 42 days) at the time of booking. (iv) A refundable security bond of $250 will form part of your booking tariff to cover any incidental breakages or other costs incurred as a result of your tenancy. This security bond will be refunded to you within 7 days of your departure from the property, pending a satisfactory inspection of the property by Uptown Apartments staff. (iv) Once the initial deposit or full payment has been received, you will receive an email confirming your booking. The contract between us will only be formed when you receive the payment confirmation email and is subject to these booking conditions. (v) You should carefully check the details of your booking before making any payment, as well as the confirmation email after payment, and inform us immediately of any errors or omissions. (i) Where you have only paid an initial deposit, you are required to send to us your payment for the balance (or first instalment for bookings over 42 days) and the security bond at least 14 days prior to your arrival date. If you fail to make a payment due to us in full and on time we may treat your booking as cancelled by you. (ii) The security bond may be used for any repair and/or replacement of the property, furnishings, fixtures and fittings, any excess cleaning that may be necessary after your stay or payment of penalties for overstaying or breach of house rules. We will return the security bond to you following your departure, less any deductions in accordance with the conditions listed above. (i) If you need to cancel or amend your booking, please notify us as soon as possible. A cancellation or amendment will not take effect until we receive confirmation in writing or via email from you. (ii) If you cancel your booking 30 days prior to your arrival or earlier, we will refund your deposit immediately, minus a $150 administration fee. (iii) If you cancel your booking between 14 days and 30 days prior to your arrival, you will not receive a refund of your deposit. (iv) The balance payment (or balance of first instalment, depending on the length of your stay), will be automatically processed 14 days prior to arrival, but will be refunded if you cancel between 7 days and 14 days prior to your arrival. Your deposit payment will not be refunded. (v) No payments will be refunded if the booking is cancelled within 7 days of your arrival. (i) Uptown Apartments will make every effort to ensure the property is available as booked. However, Uptown Apartments reserve the right to make alterations to bookings due to unforeseen circumstances (eg fire, flood, apartment damage, etc). We would not expect to have to make any changes to your booking, but sometimes problems occur and we may have to make alterations or, very occasionally, cancel bookings. (ii) If this does happen, we will contact you as soon as is reasonably practical and inform you of the cancellation or the change to your booking. If we cancel your booking, we will refund you any fees you have already paid to us. However, we will not be liable to refund you for any fees you may have paid to any third party in connection with your holiday (including, without limitation, fees for travel, entertainment, activities or insurance). (a) You agree to pay the accommodation fees as set out in the booking summary without deduction. You also agree to discharge the cost of any damage to the property or contents, and to pay any fees in relation to overstaying or breach of house rules. (b) By accepting these terms you agree to pay the accommodation fees in full and you authorise Uptown Apartments to collect the full amount referred to in the booking summary immediately. If you fail to turn up to a booking or check-in then you will be responsible for the entire accommodation fees for the booking (and you hereby authorise Uptown Apartments to deduct such sums from the credit or debit card details which you supplied when making the booking). (c) All transactions are processed in Australian Dollars. (d) All fees and charges will be collected by Uptown Apartments. (e) Uptown Apartments does not charge GST. As part of your booking tariff, Uptown Apartments will charge you $250 by way of security deposit. Furthermore, Uptown Apartments will be entitled to make further deductions from this credit or debit card in the event of any damage to the property or its contents, or in the event of late check-out or overstaying. Your check-out time is as stated in the booking summary. Unless you have agreed to a late check-out with Uptown Apartments or a further period of occupation then you will be liable for an additional full day’s accommodation fee per day (or part thereof) for any unauthorised overstaying. If we have a booking due to arrive on the day of your scheduled departure, our cleaners arrive after your check-out time and you have not checked out and we are unable to contact you, then we reserve the right to enter the apartment, remove your belongings, change the locks and take such further action as may be necessary (and we will charge you for the costs of any such action). If our cleaners arrive after your check-out time and you refuse to leave, we will dispatch security staff to evict you and you will be liable for the costs. (a) You have primary responsibility for your own safety during your stay with Uptown Apartments. You must read any fire or health & safety guidance included in the Guest App for your apartment. (b) If you become aware of anything during your stay which you believe is a health & safety risk you must inform Uptown Apartments immediately. (c) You must comply with the House Rules and you must also comply with any building regulations and any reasonable directions of Uptown Apartments. (d) If you allow more than the agreed number of people to occupy or stay in the apartment you will be liable to pay a supplement of up to $500 per night in respect of each unauthorised guest and the rental may be terminated immediately. (i) keep the apartment clean, tidy and clear of rubbish. Upon departure, you must remove any rubbish, put any dirty kitchenware in the dishwasher and turn the dishwasher on and leave the apartment generally tidy. Please do not wash and towels or linen, as our cleaners will remove these items from the apartment when they clean. (xi) not have any gathering of 8 or more people in the apartment without prior written consent from Uptown Apartments. (g) Parties are strictly prohibited in all Uptown Apartments. If you breach this condition, you agree to pay an additional fee of $1000 and will be evicted without notice and without refund or credit for any nights unused. (h) You hereby indemnify Uptown Apartments in respect of any costs, claims, liabilities or expenses suffered or incurred by Uptown Apartments (or their agents) as a result of your breach of any clause in this agreement. (a) You must notify Uptown Apartments of any damage to the apartment, contents, fixtures or fittings which occurs during your stay, even if you regard the damage as fair wear and tear or if you do not believe the damage is your fault. (b) If you do not notify Uptown Apartments of any such damage you will be fully liable for such damage on a full replacement basis. (c) Any deductions for property damage will be taken from the credit or debit card details you have supplied for payment of the security bond. For the avoidance of any doubt, you will be liable for the full amount of any damage and not just the amount of the security bond. (d) If any key to the apartment is not returned upon check-out, you will be charged for changing all related barrels and a full set of new keys. (a) will not be liable to you for any business, financial or economic loss or for any consequential or indirect losses such as lost reputation, lost bargain, lost profit, loss of anticipated savings or lost opportunity arising as a result of this agreement, the Accommodation or the rental (whether such loss arises as a result of Uptown Apartments’ negligence or otherwise). (b) Uptown Apartments’ liability for all losses (with the exception of personal injury or death arising as a result of negligence) will be limited to the cost of obtaining replacement accommodation for the agreed Licence Period or the amount of the Accommodation Fees and charges payable by you, whichever is the higher amount. (c) Nothing in this clause limits or excludes the liability of Uptown Apartments for death or personal injury arising as a result of their negligence or the negligence of their agents or employees. (b) You will not be entitled to withhold by way of set-off, deduction or counterclaim any amounts which you owe to Uptown Apartments against any amounts that may be owed to you. (c) Uptown Apartments will be entitled to sub-contract or delegate their obligations under this Agreement. (d) Uptown Apartments will not be liable to you or be deemed to be in breach of these terms by reason of any delay in performing, or any failure to perform, any of their obligations, if the delay or failure was due to any cause beyond its reasonable control. (e) These terms and the Booking Summary represent the entire agreement between the parties and supersede any previous marketing information, representations or agreements whether recorded in writing or otherwise. (f) The parties agree that these terms are fair and reasonable in all the circumstances. However, if any provision of these terms is held not to be valid by a Court of competent jurisdiction but would be valid if part of the wording were deleted, then such provision shall apply with such deletions as may be necessary to make it valid. If any of the provisions in these terms are held not to be valid the remaining provisions of these terms shall remain in full force and effect. (g) These conditions are governed by and construed in accordance with the laws of the State in which the Accommodation is located. You agree to submit to the exclusive jurisdiction of the Courts of that State. (h) If you breach these terms and conditions and Uptown Apartments decides to take no action or neglects to do so, then Uptown Apartments will still be entitled to take action and enforce their rights and remedies for any other breach.